Tommy's personal collection of random memories old and new associated with my "wild life" on Fair Isle one of the Shetland Islands part of Scotland and the most remote inhabited island in the UK. 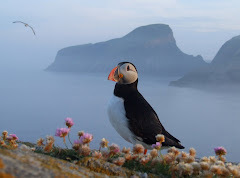 population 60 people, 1200 sheep, 20,000 puffins and a few rare birds. Fair Isle's South Lighthouse lost it's wall yesterday due to high breaking waves. Dave, Josie & Peter who live at the Lighthouse are safe & well, flats undamaged. My artist studio is untouched thank goodness, but the Northern Lighthouse Board's engine room window was smashed, flooding the room & equipment. The window was temporally covered with a board, full damage will be assessed tomorrow when a NLB man arrives. The wall is gone form the road entrance to the foghorn. Large chunks of wall have been move by the waves. While everyone comes down to assess the damages, some folks say they seen storms like this before. But that wall had been there for maybe a 100 years? I'm not sure when the fog horn was put in? Do they really have the money to rebuild it, much less clean it up? Let's hope it's insured. The wall plaque commemorating the WW2 bombing of the Lighthouse still stands. You know that bench you like to sit on... I saw a few pieces in Hultry Geo. The 4"by 4" post anchoring the bench was violently snapped off, stone and concrete scattered everywhere. Who put all the rocks on my grass? That's not a goal post on the football pitch. One goal post has been moved up the Skaddan by the Lifeboat Shed, the other is on the Muckle Uri Geo Beach. This post was to keep the sheep out of the Oysterplants on the beach? You can also see the grass is covered in gravel. We will have to see this spring how many of they rare plants are left? because, I can't find no trace of them now. has some big divots made in the grassy slope by tumbling bits of wall pushed by waves. Rocks thrown down the road. The stone wall is gone... or moved further a field. The large waves churn up the bottom of the ocean washing fish onto the beach. Yum! fried Octopus for dinner! I have never seen or found Sun-stars on the beach before. Today I found 3! I'm guessing their legs were smashed off by rolling rocks in the high surf. My sea shore guide says a Sun-star can have 8 to 13 legs, the one Sun-star had 13 legs while the one to the left had 14? A new species for us found by Henry - Solaster endeca - 9 armed Purple Sun-star. Liz taking video of the waves and damage to the Lighthouse. Yes, We did eat the Octopus! Fried in panko breadcrumbs served with a wasabi soysauce. The next night we ate the rest braised in Spanish spices over pasta. An ill wind blew you some good then Tommy! Its amazing the damage! Wow, never underestimate mother nature. Tommy - I guess we'll need to wait a while to play the golf course as part of our epic efforts to play every course in Scotland for Cancer Research UK. Maybe May or June but we'll be in touch with Tommy well beforehand. Tommy I appreciate your hard work to maintain this blog and set it as public. I am looking for further blog post. Wow! What a loss it is! Thank got Your studio saved. Follow my photography on Instagram - click on photo to see more. see who is is staying and what I'm cooking! 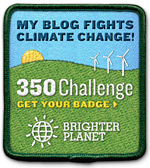 click on photo to see and join. * Advertise Here! 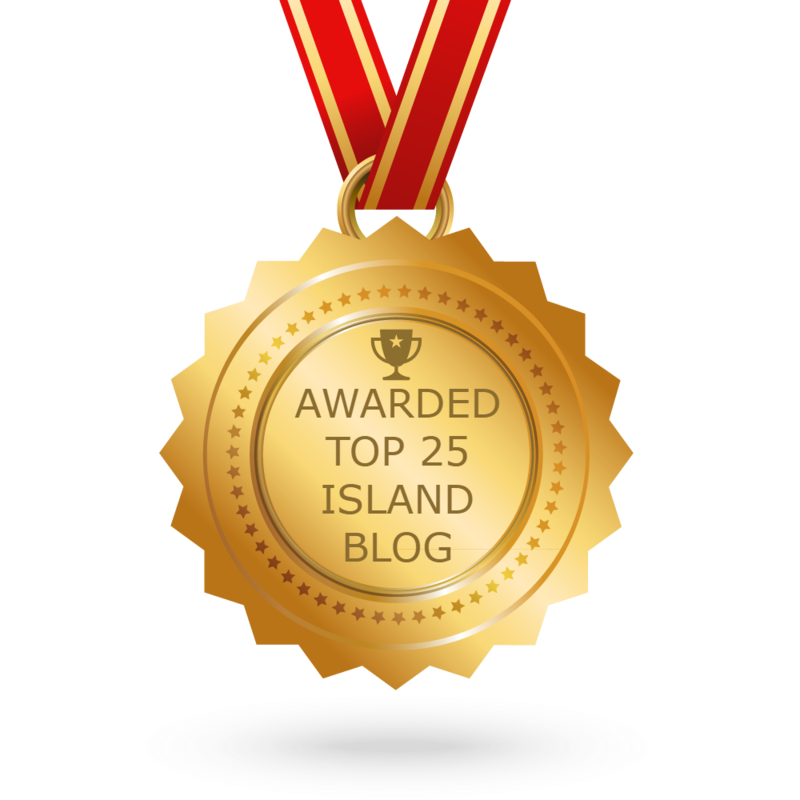 * Support Fair Isle Blogging! Welcome to my blog! I moved to Fair Isle Nov. 2006. Originally from Saratoga Springs, New York, USA. I live in the Auld Haa House built for the Laird in the early 1700’s. Wow! What history! What a view! I’m an “Artist” though it is not easy to finding the time to sculpt or paint around here. I have an Artist Studio and Gallery/Shop at the South Lighthouse. I also have reinstated the Fair Isle Lighthouse Keepers Golf Course on the nearby croft land. I run and operate as well as cook for my Auld Haa Guesthouse, with all those guest it keeps me pretty busy. A few hours every month I train as a member of H.M. Coastguard Search & Rescue Team. I have been a life long sport fisherman, since moving I have also become an enthusiastic birdwatcher. I like to share my adventures with friends & family. Media interest surrounded our move and choices, so people all over the world like to see if we are still alive. Birdwatchers wonder what bird is next? I promote Fair Isle by attracting visitors and worldwide awareness of Fair Isle, it’s knitting & heritage. I just love showing this truly amazing place to everyone, most especially my son. Cheers. Waxwings - Oct. 25th 2010 a day we'll always remember. 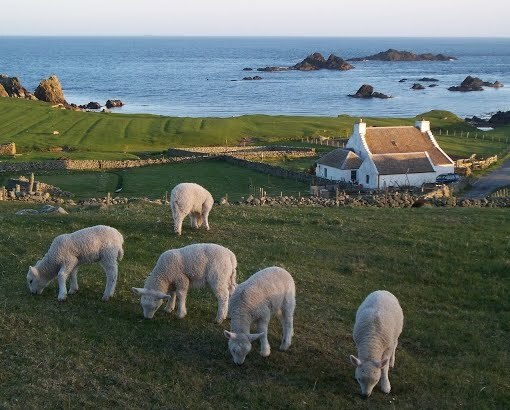 Do you want to live on Fair Isle? Barkland Croft to Let. Great Auk Clones to be Hatched on Fair Isle! Extinct no More? Lighthouse walls fall to the biggest waves in the world. Henry & the Waxwings! hand feeding again! Tommy H Hyndman & Ben Fogle's New Lives in the Wild. UK. 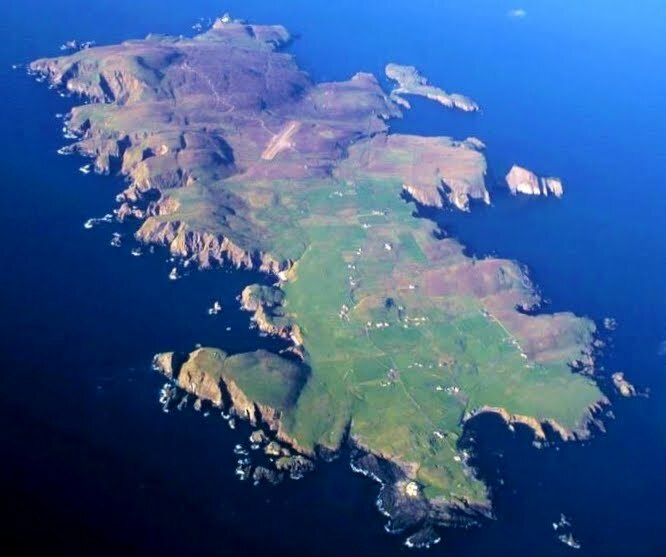 Bishop visits Fair Isle and so do the Rare Birds! 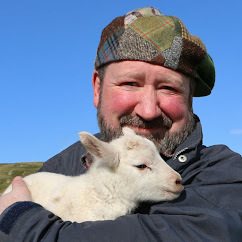 Puffins & Lambs - It's that time of Year!